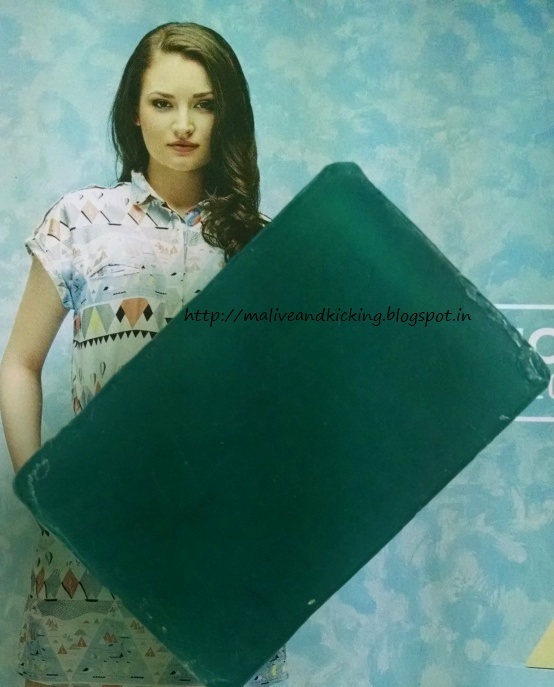 Coming up today is a review of minty handcrafted bathing bar by IHA Vedic. 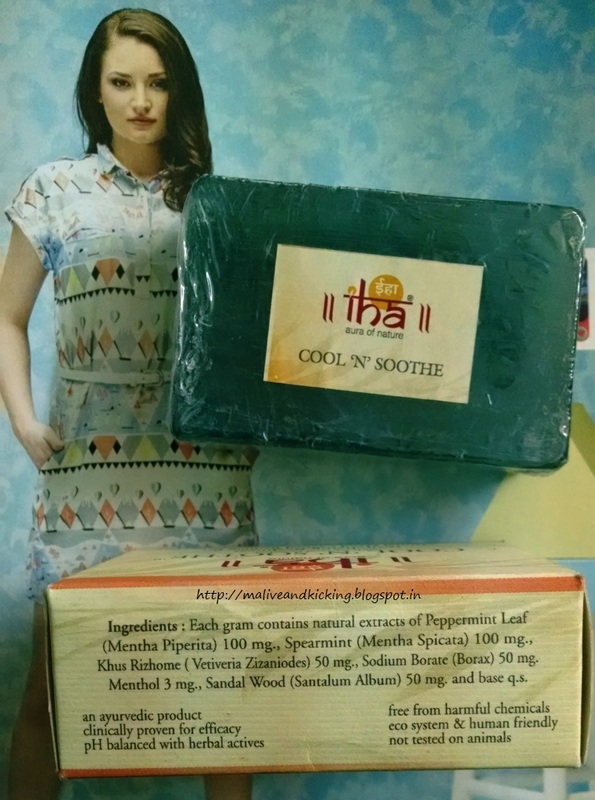 IHA Vedic Essentials COOL ‘N’ SOOTHE Natural Bathing Bar keeps you cool, fresh and revitalized through out the day. It’s herbal actives fight body odor, soothe & heal sweat rashes and prickly heat, leaving a cooler, fresher and un-irritated skin 24 X 7. 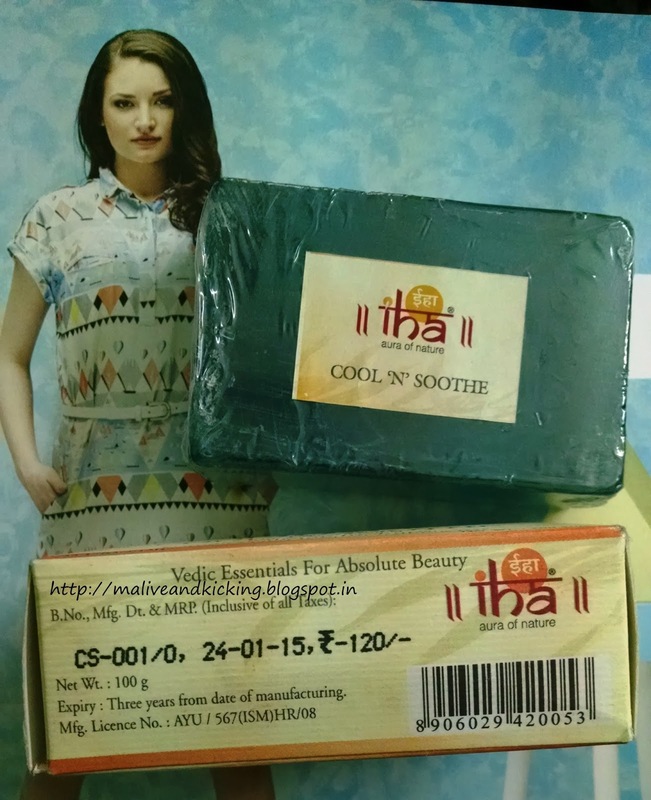 IHA Cool 'n' Soothe bathing bar is a handcrafted ayurvedic soap bar in deep greenish blue color. It comes wrapped in plastic sheet with a label that reads the soap name. Its good to have this label so that you know which variant is it in case you lose the outer cardboard box. You can find all the information about the bathing bar on the cardboard box. The soap smells refreshing on opening the plastic sheet covering. The light, uplifting fragrance is inspired from mint, so is pleasantly bearable to most people & it doesn't last very long. Taking a bath with this bathing bar gives mild cooling sensation. Post bathing, it left my skin bit drier though other family members felt nothing of that sort. It may be because of my skin type or because my skin need more moisture during winters. I may expect this soap to perform better for me in summer season. The soap bar produces no extra-ordinary foamy lather, but generates light creamy one to cleanse the skin gently. It doesn't worries me at all as long as the purpose if solved. The soap claims to be free of chemicals, so I already expected only light lathering which is a usual characteristic of handmade soaps. The soap doesn't melt any extra so may last about a month. It helps fighting against any bad odor, so can be a good choice to people facing body odor problem. an ayurvedic, hand crafted soap. pH balanced with herbal actives. can make the skin dry if you already have dry skin type, else no other dislikes. The major problems with soaps is that they can make skin dry. I guess winters is the season when you should use bath gels or cream. Great review! I don't think season matters so much in deciding what to use, i feel its mainly the infusion of ingredients in a product that is more important. Even bath gels etc can cause dryness. Looks like a good choice for oily skin beauties.